Changelly is an exchange platform that empowers users to trade cryptocurrency with one another within a simple, easy-to-use interface. Established by MinerGate enthusiasts in 2013, the website acts as a host for traders to exchange coins at the most competitive prices on the internet. By integrating Changelly’s technology into several of the most prominent trading platforms, the company can guarantee a secure, quick and competitive service. As a cryptocurrency hobbyist, I closely examine the intricacies of the best rated exchanges. Recently, I have taken a closer look at the Changelly network. For the proficient skim reader, I have listed all of the positive and negative qualities of the exchange, but the complete detailed review will be offered below. Be sure to check out the larger writeup to see how this exchange can best serve you. 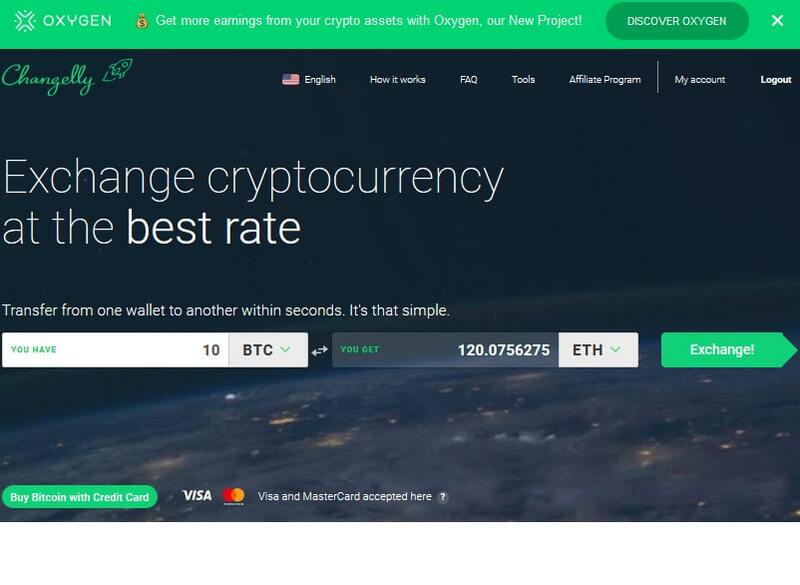 Overall, Changelly is a suitable website with a lot of flexibility. Between the different applications and affiliate programs offered as well as the most competitive exchange rates, it’s hard to go wrong. While Changelly is quick and trustworthy, some detractors are visible. For example, the site only credits USD and EUR, which can cost those with alternative currencies a great deal in exchange fees. Additionally, no support for PayPal exists and some restrictions apply to bank cards. Getting your money onto Changelly might be more work than you anticipated, but the fair nature of the service and generously low commission rate more than make up for it as you begin trading. What’s the best part about Changelly? The company provides more services than just exchanging coins. One example is the Changelly affiliate program. By encouraging other users to sign up and trade, you stake a claim to 50% of the commission fees generated by those transactions. This is a permanent engagement, so no maintenance is required. Another great tool is the instant exchange widget, which is embedded into third-party websites to allow instant crypto swaps. Similarly, Changelly has a payment button which can be a great feature for a variety of merchants. Both of these services are great for adoption and the long-term health of cryptocurrency. Finally, Changelly allows users to add their own coins to the exchange. By filling out a form and discussing terms with a representative, new and promising tokens are added frequently. Changelly operates by integrating its API into other top markets including Bittrex and HitBTC. This interface analyzes the median prices between all platforms that have integrated this API. Changelly then calculates the most lucrative price with the obtained information. This way, customers can bypass the frustration of locating good prices. Instead, they are presented with the optimal choice. In reciprocation, Changelly charges a small commission fee. A critical nugget of information to have is the minimum and maximum amounts on any given transaction. The good news is that, although transaction times may increase, there is absolutely no maximum amount that may be traded. However, a minimum amount does exist, which is a very small number that changes based on market conditions and choice of coin. If blockchain and Changelly fees cannot be covered by the miniscule transaction amount, then the activity will be declined. Fortunately, the website displays an error message when there are insufficient funds. Blockchain Fee – These fees change rapidly with the ups and downs of the market. Network fees can be determined by blockchain activity (or lack thereof). Changelly does not influence them. Changelly Commission – Changelly deducts a 0.5% commission fee for each transaction which is charged once the process is completed. Register. Create an account like you would on any website by providing an email address and payment method. Once you upload a cryptocurrency (or conventional currency), you are ready to exchange. Closely track the going rate of the cryptocurrency you wish to purchase. On Changelly’s home page, select both the currency you possess and the one you intend to buy. This will automatically give an up-to-date exchange rate. Click “Exchange!” to proceed. Type in the wallet address for the recipient. Doing so will ensure your transaction goes smoothly. Double check all information. Receiving a lesser amount than shown is not uncommon; these numbers can vary as fees fluctuate. Use QR code or address to give Changelly the necessary funds. You will find both the code and address after your transaction is made. Mobile users can easily snap the code, while traditional computer users will need to input the address. View your transaction’s condition. Once Changelly has received funds from your wallet, they facilitate the transaction. Times can vary from 5 to 30 minutes, but that wait time can increase due to network issues. Once complete, a hash is generated. This hash denotes that you’ve authorized the transaction, much like a confirmation number. Talking about the exchange is all well and good but testing it out is a whole other ball game. To assess the reliability of Changelly, I decided to utilize the service. I exchanged LTC to BTC and this is what happened. 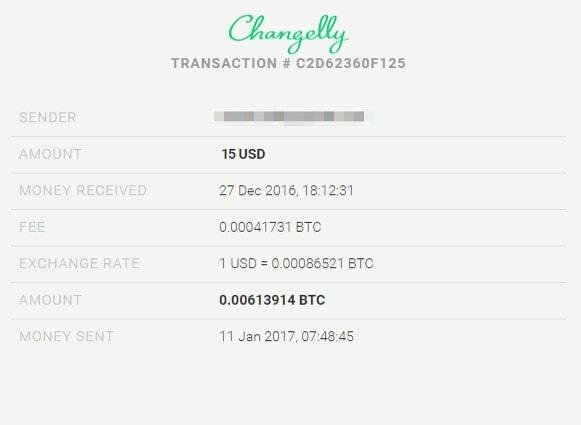 When I entered my 5 LTC into Changelly, the prompt showed that I was to receive 0.115 BTC in return. Changelly received only 4.97 LTC, as 0.03 was taken to cover the network transaction fee from the Litecoin blockchain. At this point, my 4.97 LTC was worth 0.1127 BTC, which covered some increase in LTCs going rate. 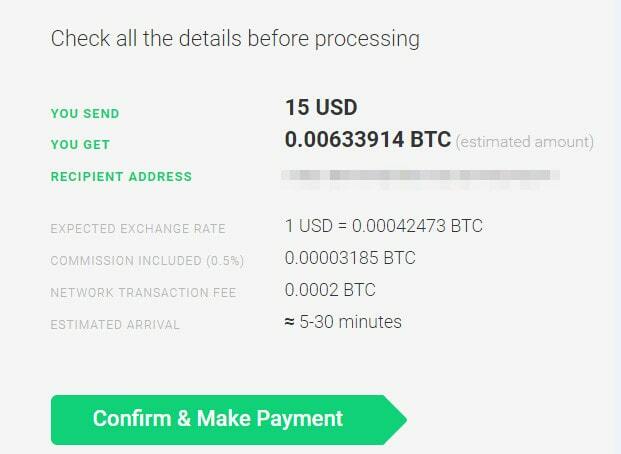 Once this process was finished, Changelly charged their 0.5% fee, which left me with approximately 0.1121 BTC. At this point, 0.0005 BTC was taken as the Bitcoin blockchain fee. I had 0.1119 in my wallet, which was slightly less than Changelly estimated. The network fee percentages are reliant totally on the blockchains themselves, and you are charged a network fee from BOTH blockchains, not just one. The 0.5% commission fee was a considerable hit, but it was fixed and worth it for the ease of use while getting the most optimal rate. Ensure USD is selected Be sure this is on the leftmost box as this indicates you are spending USD to purchase cryptocurrency. View your chosen crypto and its rate. This will be supplied after hitting the “Exchange!” box. View the current rate, applicable fees and estimated waiting time. Type or paste in your wallet address. 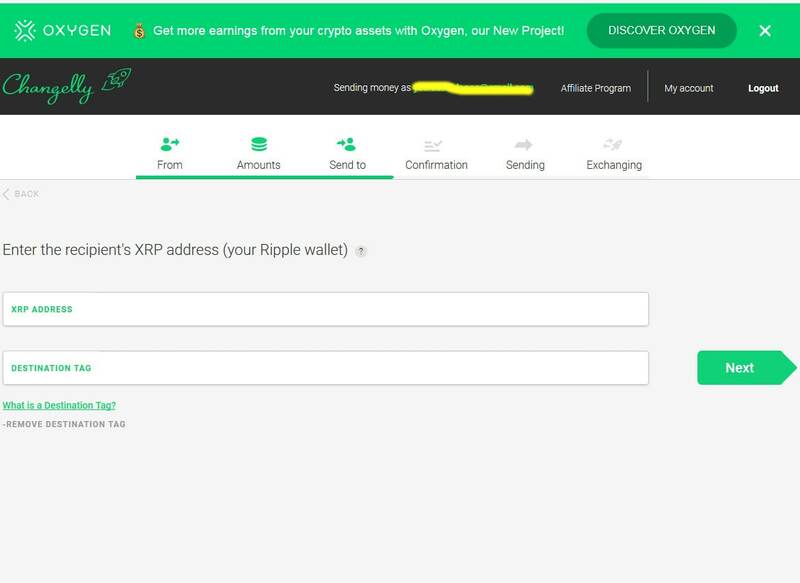 This lets Changelly know where to send the funds. Confirm this information. Once you do this, the transaction is made, and you will be prompted for your personal bank card details. This will include a phone number attached to the account. You will be notified via phone with a specific 4-digit code. Enter that into the next box shown. View your bank statement online. It will have a 3-digit code for you to enter. If you cannot locate this code, there is a secondary method which involves sending a photo of you holding up your passport for verification purposes. Wait 5 to 30 minutes. Your transaction should finish during this time and you will receive both your funds and a virtual receipt. There some restriction when you carry out payments by banking cards. Changelly has a few rules during the first few transactions with a bank card for verification purposes. The platform can continue limiting for a first week, months or so. Besides they vary by region. We divided them on three areas: first – USA, Canada, Australia, second – European countries, and third – The Commonwealth of Independent States. Let’s check them out. USA / Canada / Australia – $50 cap on initial transaction. Subsequent purchase available in 4 days at $100 limit. No more than 3 deposits can be done in the first 7 days. CIS region – $200 limit on first deposit. Complete limit for first week is $2,000. First month cap is $10,000. EU – $100 limit on initial transaction. After 4 days, the limit is increased to $200, with a bump up to $500 after a week. Limited to 6 payments total in the first 7 days. 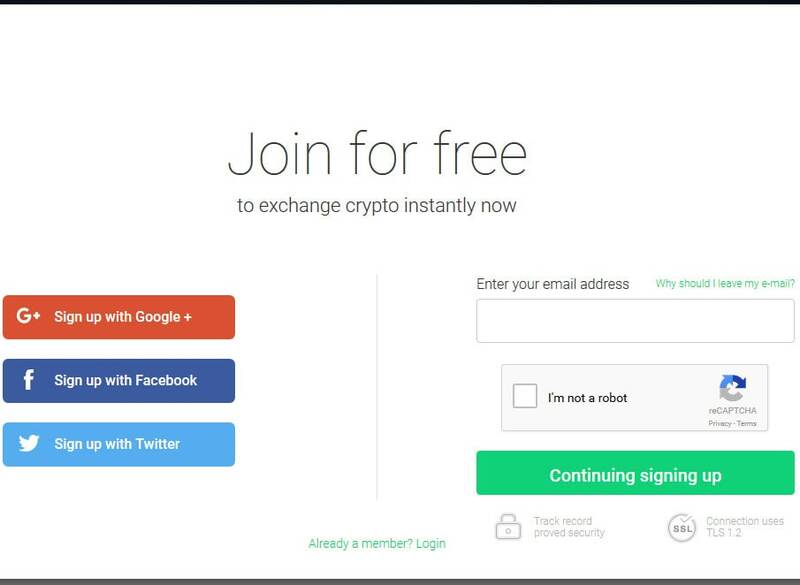 The Changelly Referral Program was initiated to spread the word about the company’s offering and benefit the end-user. The structure of the program is easy to comprehend. If you sign up another person using a special referral link, you are entitled to 50% of Changelly’s commission on each transaction. That’s 0.25% per transaction! This link is good forever and the reward is offered in Bitcoin. Additionally, several widgets are available that can be added to affiliate websites. These include payment and immediate exchange widgets that any person can use with ease. They are customizable right down to the widget’s color. Below, I’ve examined the most prominent coins Changelly has to offer. Knowing more about each coin is necessary to get a more wholesome understanding about your investment. See the “Find More Info” column to see what each coin is all about! Please note that while the minimum amount is not fixed, these are suggested numbers to beat the fees. 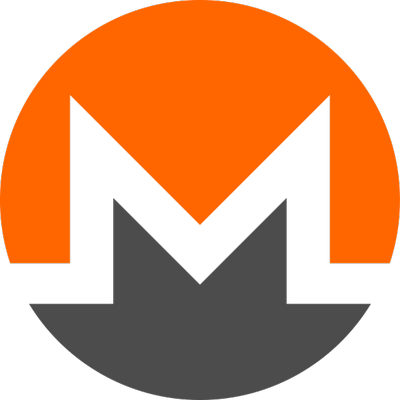 ≥ 0.00085 0.004 Show MoreBTC is the original decentralized currency. It offers quick payments to anyone in the world. Software developed by Satoshi Nakamoto. 0.00042 0.09517652 Show MoreEthereum was created to pay for the complex computational power of the Ethereum network. Allows peers to use smart contracts despite no regulatory authority. 0 2 Show MoreNeo is a Chinese platform for smart contracts. Created for the integration of usual currencies with blockchain, it acts as a liaison between legacy services and the crypto universe. 0.02 0.10005415 Show MoreDash negates traceability in transactions. This service, known as “Darksend”, gives security in addition to speedy transactions. 0.1 0.32021818 Show MoreMonero is a rather popular token which uses CryptoNote technology. It is unique because it did not fork from BTC. 0.000012 135.33977842 Show MoreRipple was designed with quick, secure transactions in mind. Unlike most cryptos, all of its supply is active and is unable to be mined. 0.003 0.49134559 Show MoreThe first fork of BTC. Litecoin enables some of the fastest transactions in the crypto world. The supply is 4x that of BTC at 84 million. 0.00001 931.3986343 Show MoreStellar is supported by the Lumens (XLM) network. The currency provides software to assist in utilizing the Stellar network with fiscally sound practices in mind. 0.031 0.08869991 Show MoreBitcoin Cash forked from BTC in mid-2017. The “cash” is labeled as a long-term solution to Bitcoin’s ultimate problem. The block size is 8MB as compared to Bitcoin’s 1MB. 1 28.74772129 Show MoreTether was created to convert traditional money (USD, ERU, etc.) into cryptocurrency. Each tether is matched by fiat, which means it is protected against Bitcoin’s price swings. 0.00042 2.57073354 Show MoreEthereum Classic refers to a blockchain state preceding the fork of the first ETH blockchain. Blocks in the classic chain are hacked. 0.01 104.90649901 Show MoreWhile not so much a blockchain at all, Golem is more of a supercomputer. It acts as a global decentralized computer that can be used for calculations. Payment to use the computer is done in GNT. 1 28,152.70068528 Show MoreDogecoin originated as a currency built on the meme of the Shiba Inu dog. Although the currency is thought to be a joke, it’s developed a cult following and has a reasonable market cap. 0 7.229 Show MoreSteem is often compared to a social media outlet that hinges on blockchain technology. Likes, upvotes, etc. give the user STEEM. This currency is mineable. is often compared to a social media outlet that hinges on blockchain technology. Likes, upvotes, etc. give the user STEEM. This currency is mineable. 1 454.46234852 Show MoreThe next step in cryptocurrency. It is coded completely from the start with no holdover writing from BTC or altcoins. Hashing power required is minimal and a concept known as “Transparent Forging” minimizes transaction times. 0.01 3.75060083 Show MoreOmiseGO utilizes the Ethereum Network for its e-wallet service. Enables payment beyond jurisdictional lines to gain ground over legacy financial institutions. 0.001 22,110.57199041 Show MoreDigitalNote has its roots in Bytecoin. It features scalability and decentralization with a focus on privacy. Heavily influenced by the technologies known as CryptoNote and CryptoNight, respectively. 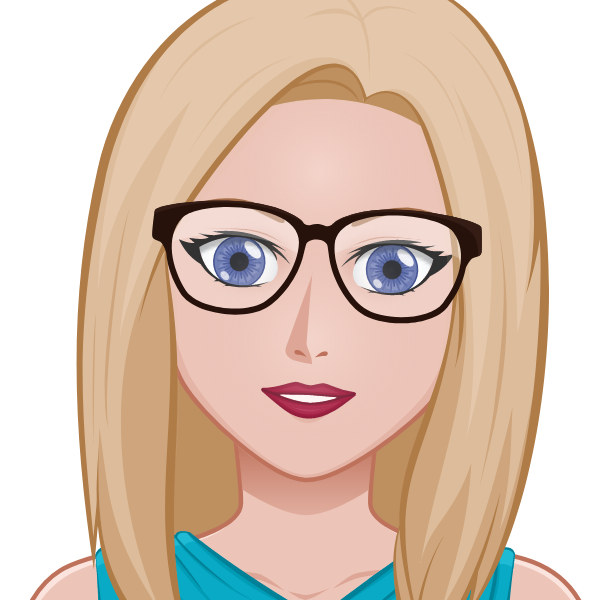 0.01 183.45702793 Show MoreThe Basic Attention Token was created with digital advertising in mind. The coin can be worked on by anyone, which provides great options to capture an audience’s attention online. Designed for the Brave platform. 0.01 0.45658622 Show MoreDigix DAO provides a use case for the documentation of physical assets through a “Proof of Asset” protocol. It is based on the Ethereum Network and InterPlanetary Files System to track assets without the need for a central database. Changelly is accessible via different social networks including Google+, Twitter and Facebook. Connect your account and get all of your pertinent exchange-related news from these sites. The website supports 12 different languages, including English, Spanish, French, Chinese and others. Transaction history is accessible from your account menu. A detailed list of all transactions including receipts and hashes is stored. This is great for the meticulous trader or for filing taxes. Applications for trading are available for Android and iOS as the most popular devices on the market. For example, Changelly is fused with the Stratis official iOS app, which means that you can buy STRAT with ease. Also, the Changelly integrable API can be used to boost your revenue from customers. 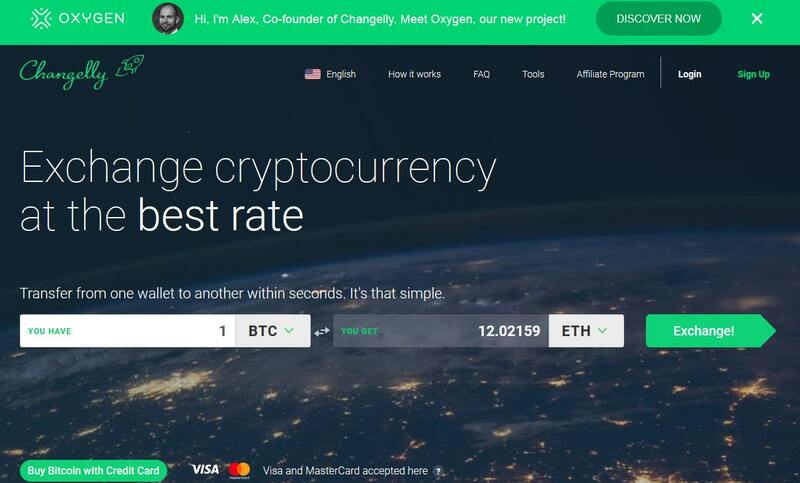 While Changelly offers the base API to all affiliates, developers can customize their settings with the instant exchange API. This includes altering the minimum and maximum exchange amounts, changing the sum of commission you wish to get, and fixing the master currency list. These protocols can be fully personalized to enhance you and your customer’s experience. 2-factor authentication is a staple in any high-security account. In addition to typical account credentials, you will need another device that has access to Google Authenticator. You will need to zap the QR code or enter the code manually on this device to be granted access. This extra layer of security is recommended and can be added through the account options screen on Changelly’s website. Everyone has questions when it comes to crypto trading. While one can put in a support ticket with Changelly to resolve any issues or answer any questions, being prepared in advance is always a sound option that will save you time. Below are several commonly asked questions. For more questions, you can refer to the special FAQ section on the official Changelly website. Every coin has an official wallet client that is free to use. Every wallet has a unique identifier known as the address in addition to a private key. NEVER give out your private key! It is vital in restoring access to a wallet. An unauthorized person with your private key can steal all your coins. The wallet address is what is required, so ensure you are using that and not your key. 2. How Long the Transaction Takes? Approximately 5-30 minutes is the expected transaction time. However, large transactions (those valued at over 1 BTC) can experience increased wait times. No time is guaranteed, and network faults may play a role in this. 3. What the Reasons of the Invalid Address? The simplest reason for this error is a misspelling or accidental typo in the information you give Changelly. Also, different currencies can sometimes be confusing. 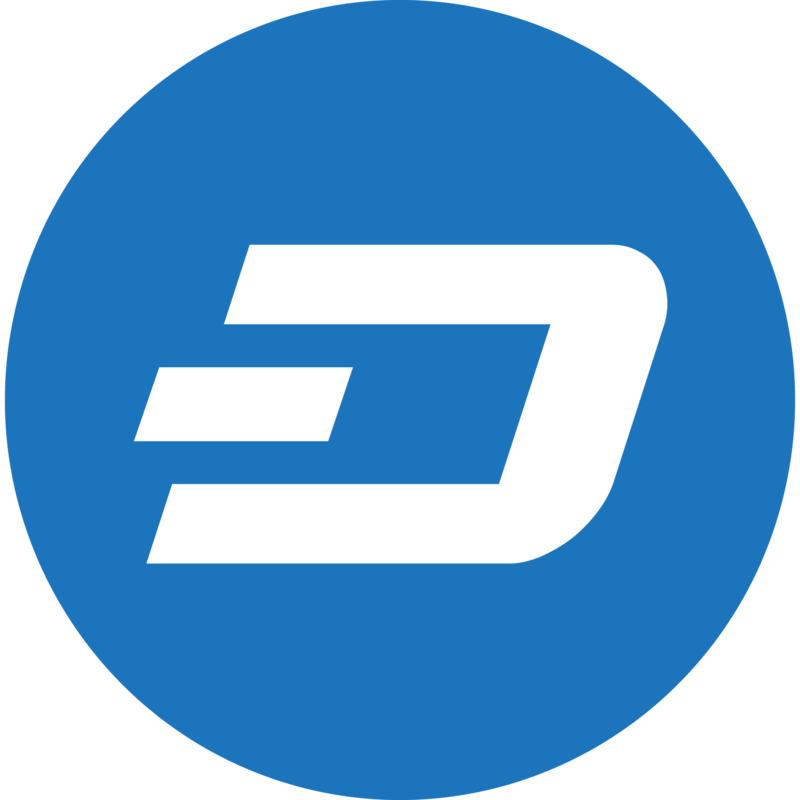 Many people mix up DASH (DASH) and Dashcoin (DSH). The same goes for Bitcoin (BTC) and Bitcoin Cash (BCH/BCC). Be sure to always double check both the currency intended for purchase and your wallet address. 4. Can I Use e-Wallets to Pay? Unfortunately, PayPal and other e-Wallets are not accepted. The most popular alternative is using your credit or debit card with 3-D security instead. 5. Can I Send Coins to One Wallet Many Times? Absolutely! Changelly supports a reusable wallet address feature. You can send more than one instance of coins to a generated address because it is tied to your recipient address. Creating a separate transaction for every case is not required.